EPA and DHA, essential to brain function and cardiovascular health, are the main ingredients in fish oil. (Health.com) -- The multibillion-dollar market for dietary supplements is filled with products that claim to boost mood or improve depression. Some products are even billed as an alternative to prescription antidepressants. Don't believe everything you read on a label. Often the claims made by supplement manufacturers aren't backed up by solid scientific evidence, and the potency and contents of supplements can vary widely. (Some are anything but "natural.") Serious depression generally requires professional help, whether or not that includes antidepressant medication. That said, some supplements -- such as St. John's wort and SAMe (pronounced "sammy") -- have been tested fairly extensively and may improve your symptoms if you experience mild depression or related conditions such as seasonal affective disorder. Below, we break down the evidence (or lack thereof) supporting the most popular supplements used to treat depression and mood. What it is: The synthetic form of folate, a B vitamin (B9) found in fruits, leafy vegetables, and other foods, that affects the neurotransmitters known as monoamines. Folic acid is sold in stores as a capsule or tablet. The evidence: Folate deficiency is common among depressed people, especially those who don't respond to antidepressants. Folic acid has never been tested as a stand-alone treatment for depression, but it has been compared with placebo as an addition to Prozac. In one study, patients who received folic acid responded better than those who received placebo -- but only the female patients. Nearly 95 percent of the women who received folic acid responded to the combo treatment, compared to about 60 percent of the women who received the placebo. Other forms of folate that are more chemically complex have been tested on their own. In one early '90s study involving elderly depressed patients, a type of folate known as 5-methyltetrahydrofolate (5-MTHF) was found to be roughly as effective as the antidepressant trazodone. The bottom line: The evidence for the use of folic acid in depression is limited and inconclusive. (The Natural Standard Research Collaboration, an independent research group, has given the evidence a "C" grade.) 5-MTHF and a related form of folate called L-methylfolate -- which is available as the "prescription medical food" Deplin -- may be helpful as an addition to antidepressants, but you should be wary of nonprescription products that list 5-MTHF, L-methylfolate, or "optimized folate" as the main ingredient. What it is: Gamma-aminobutyric acid (GABA), a neurotransmitter involved in inhibition and stress relief. GABA is sold as a capsule, pill, or powder. The evidence: Low GABA levels have been linked to depression and anxiety. Although supplement makers claim on their labels that GABA provides "Positive Mood Support" and "Supports a Calm Mood," there is no evidence that GABA supplements have an effect on depressive symptoms; no studies have been conducted in humans to date. The evidence for its use in anxiety isn't much stronger. A pair of small studies conducted by a maker of GABA supplements in Japan reported that GABA did have an anti-anxiety effect. In the first study, the researchers found that taking GABA had a relaxing effect on brain waves. In the second, people afraid of heights were asked to walk across a narrow pedestrian bridge after taking GABA or a placebo. The participants who took GABA had lower levels of anxiety (as measured by a stress marker in saliva samples). The bottom line: A connection between naturally occurring GABA and depression and anxiety has been established. Although prescription medications such as Depakote (an anticonvulsant used to treat bipolar disorder) and benzodiazepines (used to treat anxiety) affect GABA levels, there is very little evidence that commercial GABA supplements impact mood in the same manner. What it is: An organic, glucose-like compound that facilitates the transmission of serotonin and other neurotransmitters. People ingest about 1 gram of inositol a day from fruits and vegetables, whole grains, meat, and other foods, and it is also sold as a capsule and powder. The evidence: The brains of people with depression and bipolar disorder have been shown to have below-average levels of inositol, which prompted researchers to investigate whether inositol supplements could help treat depression. The initial research was promising. A small study published in 1995 found that taking 12 grams of inositol a day -- an amount equivalent to a fistful of the capsules sold in health stores -- improved depression symptoms more effectively than placebo. Surprisingly, no one has ever tried to replicate this success. Instead, researchers have studied whether inositol enhances the effects of antidepressants or mood stabilizers -- and those studies found no differences between inositol and placebo. The bottom line: Inositol's effectiveness has not been proven. Future research may yet reveal uses for the compound, but in the meantime experts caution against using it as a supplement for depression. What it is: The polyunsaturated fatty acids eicosapentaenoic acid (EPA) and docosahexaenoic acid (DHA), which are essential to brain function and cardiovascular health. Combined in roughly equal amounts, EPA and DHA are the main ingredients in fish oil, but they are also sold in formulas that include more of one than the other. The evidence: A link between omega-3 consumption and mood is supported by two main sources of evidence: People with depression have been shown to have lower levels of omega-3 fatty acids, and countries that eat a lot of fish per capita (such as Japan) have lower rates of depression. The research on omega-3 supplements is mixed, however. In several controlled trials, EPA, DHA, or a combination of the two have been shown to improve the symptoms of depression and bipolar disorder better than placebo -- but in nearly all of those studies, the omega-3s were added to antidepressant medications or mood stabilizers, so it's unclear whether omega-3s had an independent effect. And in a recent study published in the Journal of the American Medical Association (JAMA), omega-3s plus Zoloft fared no better than placebo plus Zoloft. 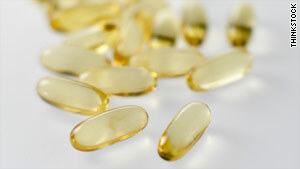 The two studies that have used omega-3s on their own for depression have also generated mixed results. One found that 2 grams a day of DHA for six weeks was no better than placebo; the other -- which was conducted in children ages 6 to 12 -- found that a combination of EPA and DHA did outperform placebo. Health.com: Supplements for high cholesterol -- What works? The bottom line: Although some of the research on omega-3s and mood disorders is encouraging, it remains unclear just how effective omega-3s are, and what formulation and combination of treatments are most beneficial. But omega-3s have few side effects and have cardiovascular and other health benefits, so they may be worth a try (after consulting your doctor first). What it is: A spice, made from the dried stigmas of crocus plants, that is used in cooking and also in traditional Persian medicine to treat symptoms of depression (among other conditions). Although they can be found online, saffron supplements are not widely available. The evidence: Little research has been conducted on saffron's effect on mood. But in a series of small controlled trials conducted in Iran in recent years, the spice has performed surprisingly well in treating mild to moderate depression. Delivered in 30-milligram doses a day, saffron has outperformed placebo and has demonstrated an antidepressant effect comparable to Prozac and imipramine (an older tricyclic antidepressant), at least in the short term. The bottom line: Although more research is needed, saffron appears to be a promising treatment for milder cases of depression. That said, using the world's most expensive spice as a dietary supplement seems impractical and pricey. What it is: S-adenosylmethionine (SAMe), a naturally occurring compound that affects neurotransmitters, including serotonin and dopamine. In the United States, SAMe has been sold over-the-counter as a tablet since 1998. The evidence: As with most of the substances on this list, lower levels of SAMe have been associated with depression. In studies, SAMe has been shown to be roughly as effective as tricyclic medications (an older generation of prescription antidepressants). But in many of those studies, the SAMe was injected, and it's unclear whether orally ingested SAMe capsules have the same effect. A 2002 review of the research on SAMe and depression conducted by the federal Agency for Healthcare Research and Quality concluded that SAMe was more effective than placebo at relieving the symptoms of depression and no better or worse than tricyclics. The report noted that more research on oral forms of the compound and research comparing SAMe to newer antidepressants (such as SSRIs) was needed. The bottom line: SAMe has proven to be useful for the treatment of depression, but questions about its overall effectiveness and delivery methods remain. SAMe does have some side effects. Most notably, it can exacerbate mania or hypomania in people with bipolar disorder, so you should not take SAMe without consulting a physician. What it is: A yellow-flowered plant, Hypericum perforatum, that has been used for medical purposes since antiquity and as an alternative treatment for depression for decades. St. John's wort is available as a capsule, tea, or liquid extract. The evidence: St. John's wort is by far the most studied alternative remedy for depression, and for the most part the results have been favorable. In studies involving people with mild to moderate depression, St. John's wort has consistently outperformed placebo, and it has held its own against prescription antidepressants. It has been shown to be similarly effective -- and in a few cases, more effective -- than fluoxetine (Prozac), imipramine, and Celexa. The effectiveness of St. John's wort in more severe cases of depression has been questioned, however. A highly publicized study of people with "moderately severe" depression published in JAMA in 2002 found that neither St. John's wort nor sertraline (Zoloft) were significantly more effective than a placebo. Due to this and other trials, it is generally recommended only for milder cases of depression. The bottom line: For mild -- but only mild -- cases of depression, its effectiveness may rival that of antidepressants. (The Natural Standard Research Collaboration has given the evidence supporting its use for mild depression an "A"; for severe depression, a "D".) St. John's wort generally has few side effects, but it can interact with other drugs, so -- as with any supplement -- check with your doctor before trying it. What it is: An amino acid -- most famous for being found in Thanksgiving turkey -- that helps produce serotonin, the neurotransmitter targeted by drugs such as Prozac (SSRIs). It is sold over-the-counter in capsule form as L-tryptophan and 5-HTP, which represent different stages in the serotonin production process. The evidence: Studies have shown a connection between tryptophan depletion and depressive symptoms (especially in women), but the evidence for the use of tryptophan supplements is thin. A 2004 review of tryptophan studies that examined more than 100 trials found only two that were of high quality and did not include other supplements. Tryptophan did outperform placebo in those studies, but the studies were small. There are some concerns about the safety of tryptophan supplements, which have been found to contain impurities and contaminants. In 1990, the U.S. Food and Drug Administration (FDA) temporarily pulled all L-tryptophan products off the market after more than 1,500 people who took L-tryptophan supplements developed a blood disorder called eosinophilia myalgia syndrome. Ultimately, more than two dozen people died. The bottom line: The overall evidence is inconclusive and safety concerns persist, although the authors of the 2004 review did note that tryptophan could play a role in patients with mild cases of depression who can't (or don't want to) take antidepressant drugs.